This post is filed under Cheese, Dry, Kraft, Macaroni, Milk, Stovetop. “My body must immediately start building immunity against whatever chemicals Kraft is using to make this dish taste so good.” – Haha. Did you ever have the Blue Box Mac with chopped up Oscar Meyer Dogs growing up? I still can’t stomach the thought of that meal. Are we using professionally taken photos now? Will the website slowly turn from highlighting the difference in claims versus reality and instead just be an advertising spot for the industry? 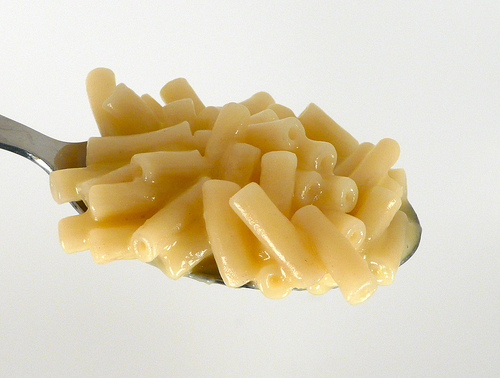 I thought I was the only one that got queasy after eating Kraft Mac & Cheese. Glad to know it is something with the product and not me. Growing up in a border town, I was always jealous of my latino peers who bragged of an exotic breakfast dish called huevos con weenies, unaware that at my house the same dish was being served up as ‘franken-fetus’. Now that I prepare my own meals, I prefer to call it Coney Island Quiche, even if my mother accuses me of being pretentious. Who cares what she thinks? She served hot dogs to children, for gawd’s sake! No, it’s just me and my digital camera. I think the site is taking photos that are easier to compare to the box photos (better lighting/backgrounds).. That way differences in coloring/texture between the box and the actual food are easy to see. It’s helpful! 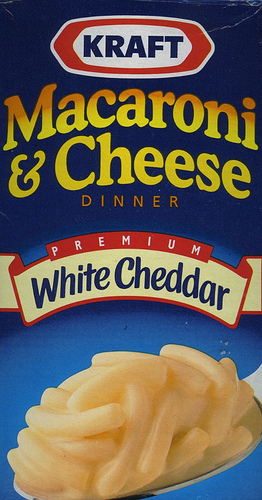 I am British and I ate Kraft macaroni cheese for the first time the other day. It wasn’t great. Luckily, I am out of hospital now.